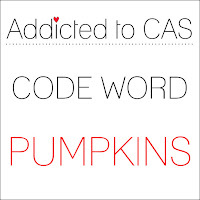 and she chose the code word PUMPKINS. My Favorite things to create a light partial background. Lawn Fawn ( Happy Harvest). The greeting is also from Lawn Fawn (Jump for Joy). not to put a bunch of colorful leaves all over! Doni, I love the stalk behind your pumpkin trolley, it adds a wonderful vertical element. Such a fabulous little scene you have created. Love your cute little wagon, Doni! I also love how you added the stalk of hay and background stenciling...such a sweet Halloween card! So cute...reminds me of being a kid! Love it! 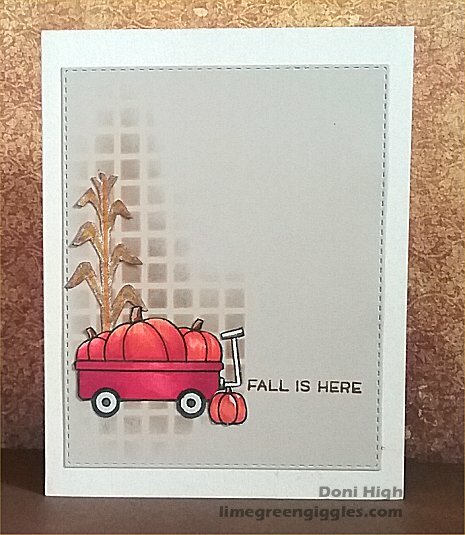 I love your little wagon full of pumpkins, Doni, and how the stenciling highlights it.